It’s almost appropriate that the first week of May should start off cooler and rainier than anytime in April. This spring will probably go down as one of the most unusual on record; indeed, it was so cold in northwest Minnesota today that precipitation actually came in the form of snow, which is something Minnesotans hadn’t seen for over two months! The strong winds have continued through this week as well; on both Tuesday and Wednesday sustained gusts were exceeding 40mph. While the wind is a bit annoying at this time of year, the rain is greatly needed in southern Minnesota, and by the end of today the total should amount to around one inch of rainfall during the past week. May is breeding time for birds–both the species that have recently returned and those that have been here all year–which means there are several nests currently being tended to in the arboretum. A pair of Cooper’s Hawks constructed a large stick nest deep in the coniferous forest in the northern part of the Arb in mid-April; occasionally you can hear the adults “cackling” at you as you walk by. A pair of Eastern Bluebirds has been frequenting one of the bluebird houses south of the Jim Gilbert Teaching Pond; two eggs were confirmed in the nest this past Tuesday 5/4. 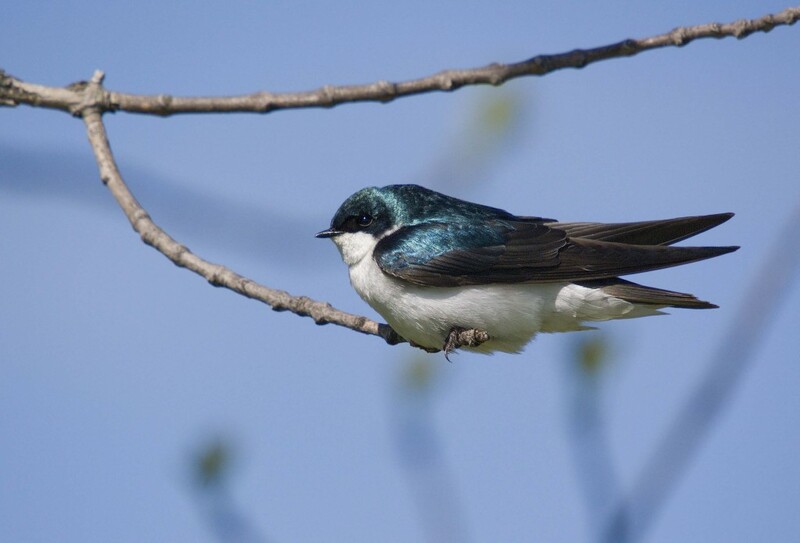 Both Tree and Barn Swallows have been busy flying about the Arb looking for suitable nesting locales, the Tree Swallows, like the bluebirds, preferring cavities and the Barn Swallows preferring the undersides of building ledges and shelters. And finally, in the expanse of the Coneflower Prairie, Horned Larks, Vesper Sparrows, and Grasshopper Sparrows, all ground-nesters, have paired off and appear to be frequenting specific territories, but no nests have been discovered yet. Tree Swallow perched near bluebird house in Arb's southwest corner, 5/4/10.